It’s beginning to taste a lot like Christmas… Ok, so I’ve not had any mulled wine yet… nor have I dabbled in any Christmas pudding… BUT! I have munched a single mince pie and partaken in a very tasty Raclette gathering at Paxton & Whitfield’s lovely cheese shop, located a short stroll from Piccadilly Circus. On this occasion, I had taken along two of my friends, Simon and Alex. Simon had actually been to Paxton & Whitfield’s a few times, mainly for wine-tasting evenings, but Alex and I were newbies. Did you know… Paxton & Whitfield are proud to be The Royal Family’s official cheese supplier? If you’re a self-confessed curd nerd – or you know someone who is – then Paxton & Whitfield has got to be on your Christmas shopping rounds this year if you’re heading to London. If not, you can also order online. I’ve got to say, their collection of cheeses is pretty spectacular. I immediately thought of my grandad. My grandad is a HUGE cheese fan. I think there’s been multiple Christmases now where someone has bought him a cheeseboard or cheese-related gift. 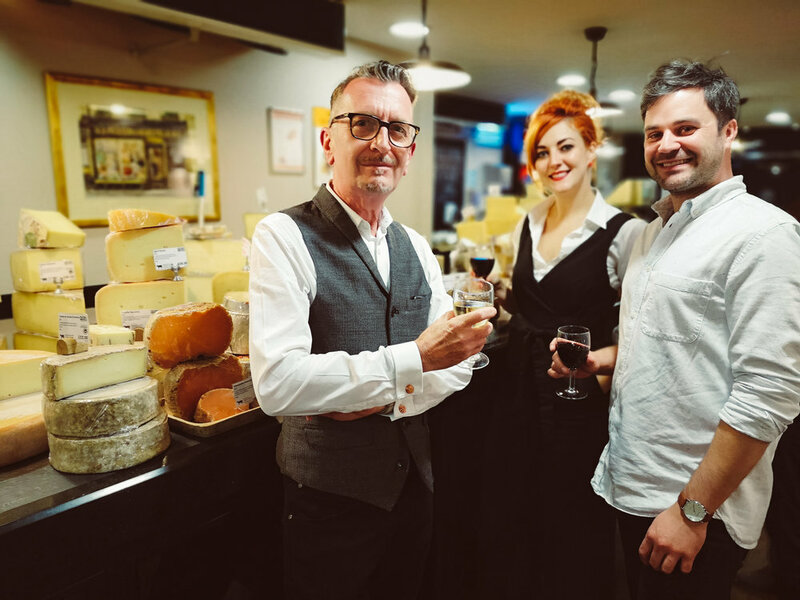 If you’re looking for a decent bottle of wine or port to go with your cheese course, Paxton & Whitfield’s cheesemongers can recommend you just the tipple! It was a good 6-years or so back now when I had my first Raclette experience, and it was just as marvellous then. I’ve got a real thing about social shareable foods. Small plates of Tapas and Mèzze between friends are my favourite way to eat. It doesn’t matter what cuisine it is really, I just find that if you struggle to make your mind up about what to order, sharing a few dishes can really eliminate that particular form of social anxiety. 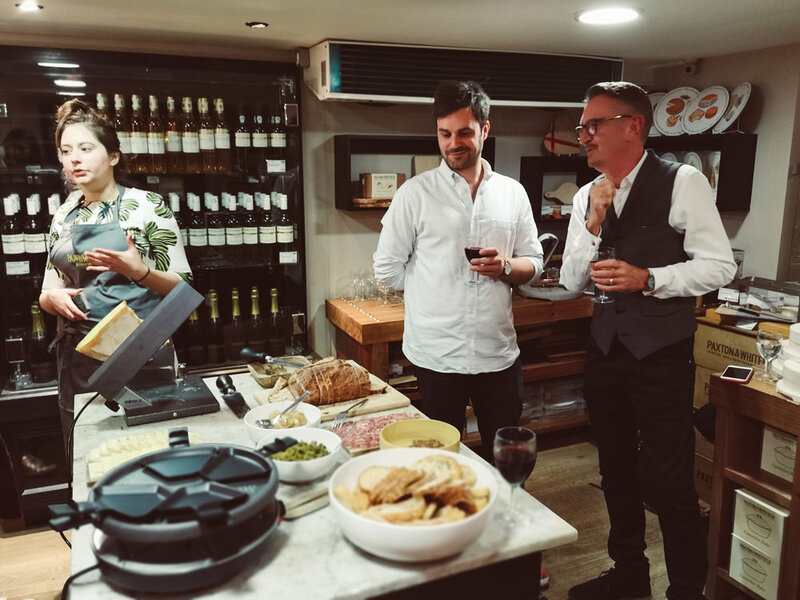 I was blown away by the passion and cheese-related knowledge that award-winning female Cheesemonger Hero Hirsh and Dan Bliss, the shop’s manager and social media guru (make sure you follow them on Instagram @PaxtonsCheese, waxed lyrical to us on the evening. The Jermyn Street store is an Aladdin’s cave of mouth-watering artisan cheeses. And you know what? Hero and Dan pride themselves in knowing all of the farmers and their cheeses personally. It’s like going to a good butchers and asking where their meat comes from. The level of care and attention is exemplary. The other great thing that I learnt about Paxton & Whitfield is that they have a great blog where they share tasty recipe inspiration, giving you new and exciting ways to pair and enjoy cheese. And then there’s the party buffet food type of thingumajiggy…. You can tell if someone’s taking their job as a host seriously if their cheese selection is on point. If you’re often left wondering what to do with all of your leftover food and meat on Boxing Day, then a raclette party could be the answer! Grab a gift hamper: Pick up a mouth-watering gift hamper, laden with cheese and other tasty morsels. Paxton & Whitfield pride themselves in putting together their gift hampers with care and consideration. And what I mean by that is there are no crappy filler items that no one wants to eat! It’s all delicious and high quality. 2. 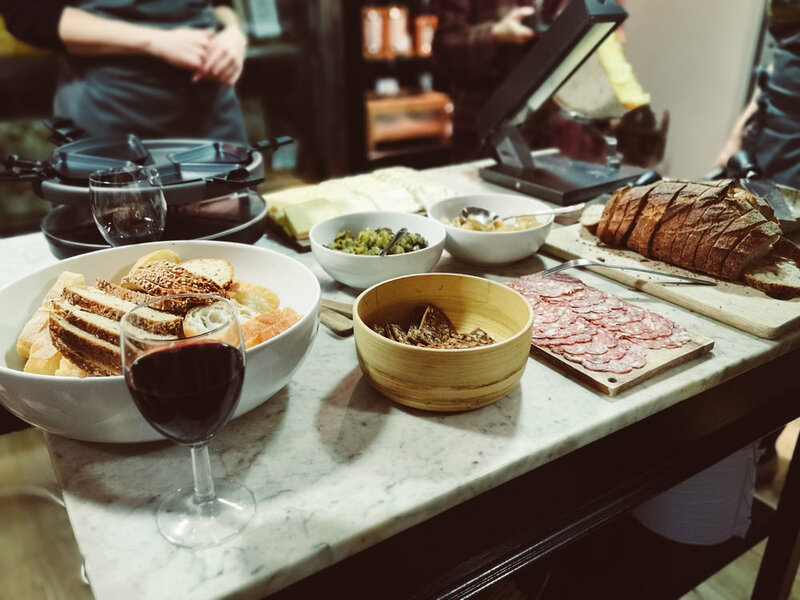 Reach for the raclette: Paxton & Whitfield sell a range of raclette machines in store, from cute little candle-powered ones to the gorgeous £300-ish copper and concrete beauties. They’re bound to bring a playful sense of occasion to any party gathering. 3. Up your cheese knife game: Whether you’re leaning towards something wooden and hand-crafted or fancy and pearlescent, Paxton & Whitfield have quite the selection of cheese knives and cheese knife sets. They do a great range of other cheese accessories too – from cheese journals to posters, milk jugs and cheese-making kits – it’s well worth a ogle. 3. Counting the pennies? Are you on a tight budget but still want to buy something personal yet purse-friendly? Pick up a cheese lovers gift box or peruse their range of cut cheese collections from £21. If you can splurge a bit more and up your budget to £60+ why not try the cheese tasting pack for 8 people (not for export). 4. Go to back to school: Take a lesson at the Academy of Cheese. Paxton & Whitfield are proud to be partnering with the Academy of Cheese to offer their Level 1 Cheese Training Programme. Interested in learning more about the history of Paxton & Whitfield? Take a peek at the story of their heritage here. I hope you enjoyed this little taste of what Paxton & Whitfield have to offer? I’m really excited to pick up some cheese for Christmas to share with my family. Have you got any favourite cheeses that you think I should try? Let me know! I’m always keen to try something new. Oooh! Don’t forget to download the Paxton & Whitfield podcast as Dan Bliss looks at things like how to pair Port and what the best cheeses are from around the world. Their blog is a great place to visit for upcoming events and also to find out what the latest news is in the world of cheese.